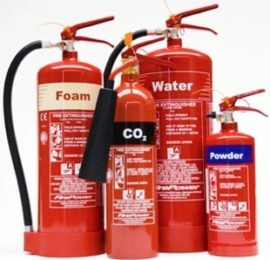 Our Fire Safety Course provides you with the training industry is looking for. Fire Safety Training allows you to use our Virtual Fire Simulator; truly a technological breakthrough that satisfies both safety and environmental concerns while providing expert training on the use of fire extinguishers. 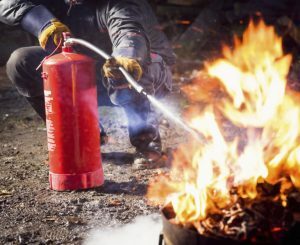 Our Fire Safety Training is based upon the fact that fires start small (known as incipient fires) and may be extinguished by knowledgeable employees utilizing the proper equipment. Without this type of training, there is a much greater risk of the fire spreading and employees being injured while using an extinguisher improperly. 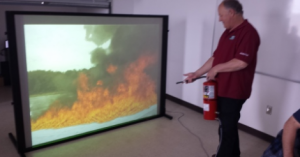 Watch METI Fire Safety Training instructor Harold Daigle use our Virtual Fire Simulator. Upon completion of this program, you will receive a wallet-size Fire Safety Ticket/Certificate, that will show you have the credentials. We keep your records on file permanently. Feel free to have your prospective employer contact METI to confirm your Fire Safety Certification. Please contact us at (902) 539-9766 or send us an email at training@metiatlantic.com for more information or to book your seat in our next class. Back to our Safety Training.